This is a 30k square foot modified bitumen roof located down in Port Lavaca, TX. The facility is owned by the Calhoun County. Little is known about the roofs history, but after a physical inspection and core sample, the roof system is comprised of a steel deck with roof insulation, mechanically attached roof board, a second layer of insulation, a base sheet and a cap sheet. The core samples came back dry and in good condition. 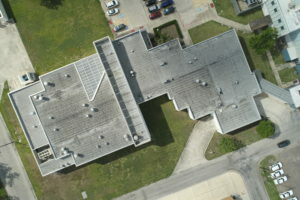 The director of maintenance contacted me with concerns about the roofs condition after Hurricane Harvey hit just last year. They observed a weathered surface and had received some money to perform repairs. Before making a decision on how to go about getting a repair or replacement done, they wanted to ensure there was no suspected moisture within the roof. 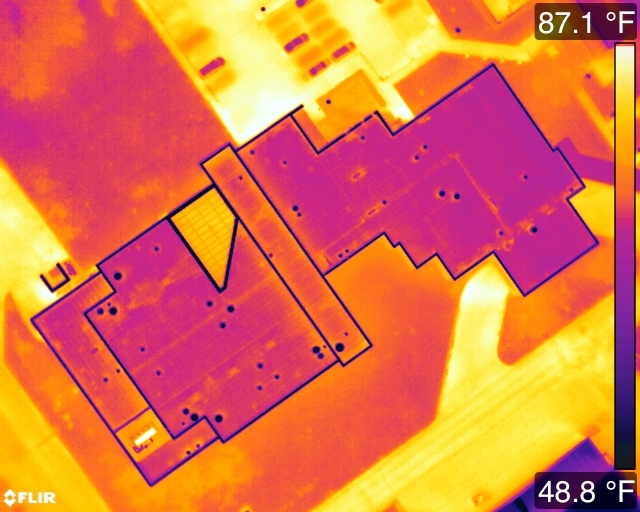 After performing a drone thermal roof scan and visible scan, our processing indicated that the roof was pretty clean on the inside. We were able to help isolate the areas that experienced some possible wind damage on the surface and made detailed notes accordingly in our report. But, in spite of hurricane Harvey’s best efforts, the roof appeared to be in pretty good condition considering its age! Our process and report was used to create a detailed assessment of the roofs condition based on an aerial infrared scan. This report was passed on to the county engineer to help decide the best plan of action for repair, replacement, or performing a roof over. We were also able to bring in a few of our trusted roofing companies we trust and routinely work with to provide a bid for performing a roof coating, extending the life of the current system and providing a 10- 15 year additional warranty. While we were unable to locate any suspected moisture, the client is able to have peace of mind in making a decision for what is best on this roof based on the evidence provided. To learn more about drone thermal roof scans and our detailed process, give us a call at (214) 842-6000 today!